It's true that people spend more time planning and preparing for a wedding day than for just about any other event of consequence that will occur in their lifetime. Everybody wants to get it "just right." What surprises us at Clark's Cove Farm is how so many then end up getting it wrong. "Warehouse" weddings in 50,000 square foot boxes ("Please follow the signs to the Smith wedding in Suite 3"), where the atmosphere is fabricated and style non-existent. "Ye Olde Colonial Inne & Taverne" weddings in musty, cramped surroundings where the lighting is dim and the food even dimmer (It used to be a successful restaurant in the 1950's. When the diners left in search of better food and good service, management had a brilliant idea: "Let's do weddings!"). We think differently at Clark's Cove Farm. 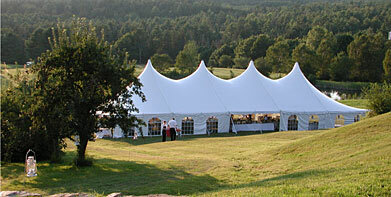 Our aim is to provide the wedding party and invited guests with an experience that exceeds all possible expectations. One that is fully-customized to your imaginings, while it reflects the transcendant natural grandeur of its Downeast setting. 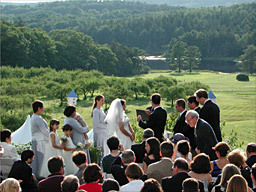 Great weddings don't just "happen." It takes knowledge and experience to produce an event that unfolds effortlessly and delivers a "This Is Everything I've Always Imagined It To Be" experience for everyone involved. 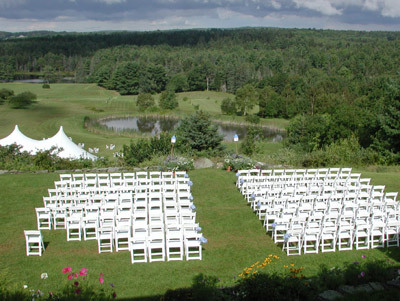 From the stuff you'll never see (backup generators and double wells, for example), to the expertise and artistry of a selection of caterers, to the variety of our venues (have cocktails in the orchard, the ceremony coveside, a lobster bake in the barn, and dancing on the terrace... or any combination of our unique locales that suit your fancy), the bywords of a Clark's Cove Farm event are unparalleled flexibility, unparalleled beauty, and unparalleled satisfaction. If a Clark's Cove wedding is starting to sound attractive to your jaded ears, you owe it to yourself to explore our offerings a little further. There's nothing we like more than opening up our corner of the world to good people.